If you were looking for a needle in a haystack, simple logic would tell you that the smaller the haystack the likelier you are to find the needle. Except for the government. Since Edward Snowden revealed the federal government’s unlawful and unconstitutional use of federal statutes to justify spying on all in America all the time, including the members of Congress who unwittingly wrote and passed the statutes, I have been arguing that the Fourth Amendment prohibits all domestic spying, except that which has been authorized by a search warrant issued by a judge. The same amendment also requires that warrants be issued only based on a serious level of individualized suspicion backed up by evidence — called probable cause — and the warrants must specifically identify the place and person to be spied upon. Because these requirements are in the Constitution, which is the supreme law of the land, Congress and the president and the courts are bound by them. There is no emergency or public safety or wartime exception to them. These requirements cannot be changed by legislation; only a constitutional amendment, ratified by the legislatures of 37 states, can do so. All of this is what lawyers and judges call black letter law — meaning it is well-understood, has not been seriously challenged and is nearly universally accepted. Except by the government. The government — which thinks it can right any wrong, tax any event, regulate any behavior and interfere with any right — also thinks it can keep us safe from the terrorists among us by cutting constitutional corners, which it has done many times since 9/11. Among the constitutional corners it has cut is unleashing its 60,000 domestic spies upon us with orders to disregard the constitutional requirements for spying on Americans and gather all the data about us that they can by listening to phone calls and reading emails, as well as gathering the banking information, credit card information, utility bills, postal mail and medical records of everyone in America, without regard to individualized suspicion. The government’s behavior is premised upon the false belief that it can morally and constitutionally interfere with our natural right to privacy without due process and upon the absurd belief that surrendering personal liberty somehow keeps us safe. As we know from the tragedy last week in San Bernardino, California, the government’s strategy and practices failed to keep us safe. The governmental failure at San Bernardino was the confluence of a state government with antipathy and animosity toward the natural right of self-defense and a federal government attempting to devour far more data than it can handle. The San Bernardino killings — like those in Newtown, Connecticut; at Virginia Tech; in Roseburg, Oregon; and in Paris — occurred on or near government property where lawful guns were banned. These no-gun zones are the most dangerous places on the planet when a person armed to the teeth and determined to kill enters upon them. In the no-gun zone in San Bernardino where the killings occurred, even off-duty or retired law enforcement personnel, trained and continually qualified in the use of firearms, and private people lawfully authorized to carry handguns are required to check their guns at the door. Can the civilian use of guns keep us safe? Of course it can. The police simply cannot be everywhere. Anything that diminishes the shooting-fish-in-a-barrel environment of no-gun zones is an improvement over the carnage we have witnessed in them. Think about it. In every mass killing — every one of them — when someone with a gun arrives determined to stop the killing, it stops; the killer flees or is disabled or is killed or dies by suicide. No-gun zones are not only unconstitutional legislative limitations on the natural right of people to use modern-day means for self-defense but also an invitation to disaster. And they are established by local municipalities with the consent of state governments. The federal failure is born of an antipathy to constitutional norms and a reluctance to engage in meaningful human intelligence on the ground. Instead of gathering all they can about everyone, the feds should concentrate on those about whom there is some reasonable belief to warrant some investigation. The feds should know the neighborhoods where the suspicious live and work as well as they know their own computer screens. Even the National Security Agency itself has admitted to data overload. In 2013, the director of the NSA at the time, Gen. Keith Alexander, was asked how many plots his spies had unearthed in their then-seven years of spying on everyone in the U.S., and he replied under oath, “About 54.” Then he corrected himself and amended his answer to one or two. When asked to identify them, he declined. 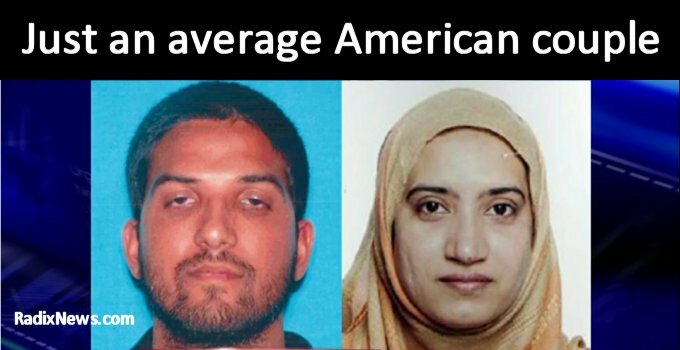 Why weren’t a recently married couple with Middle Eastern backgrounds — one of whom had been born here, the other of whom had immigrated here and achieved permanent legal residence only through marriage, both of whom recently had been stockpiling huge amounts of military-style weaponry and ammunition, both of whom had just received more than half their combined annual income in a single wire transfer to their joint bank account, both of whom had been practicing the use of their hardware at a gun range, one of whom had been known to hate Jewish people and had suddenly left his local mosque — generally known to the all-seeing and all-hearing NSA? Because the NSA has abandoned traditional techniques of on-the-ground, in-your-face human intelligence in favor of sitting in front of computer screens. And that has produced a haystack of data so gigantic in size that by the time the needle of terror plotting has been found, it is often too late.